Take a look you should because some of the transcriptions are quite incredible as well as humorous, particularly those regarding runaway apprentices from Walsall in the mid 18th century. These luckless lads are described in graphic detail, warts and all….and they certainly had warts…..and pockmarks……and scrofula and one 15 year-old was described as having no teeth at all, and had never had any…….you get the picture! I digress however, the reason for mentioning Henry Somerfield was to say that he saved me a huge amount of time in the researching process as when I went to Birmingham Library I knew exactly when and where to look. 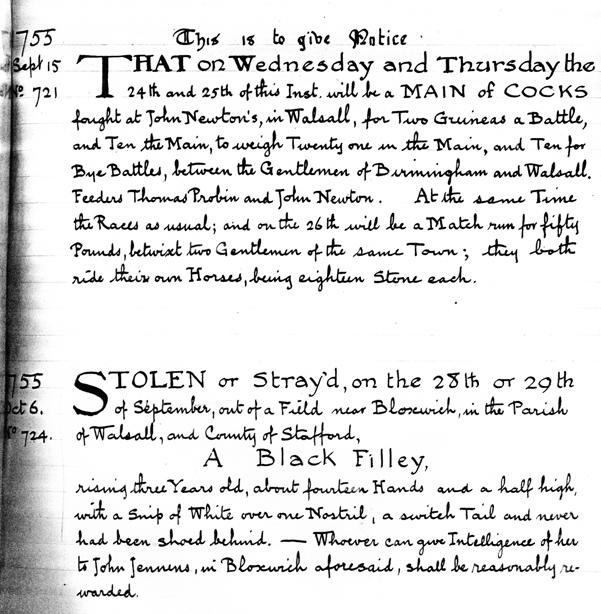 Below is Henry’s transcription for the first known announcement of Walsall Races along with some poor soul looking for his strayed or stolen ‘oss. Note the final comment about the match to be run “betwixt two gentlemen of the same town” riding their own horses and both men weigh eighteen stones (113kilos), some race! 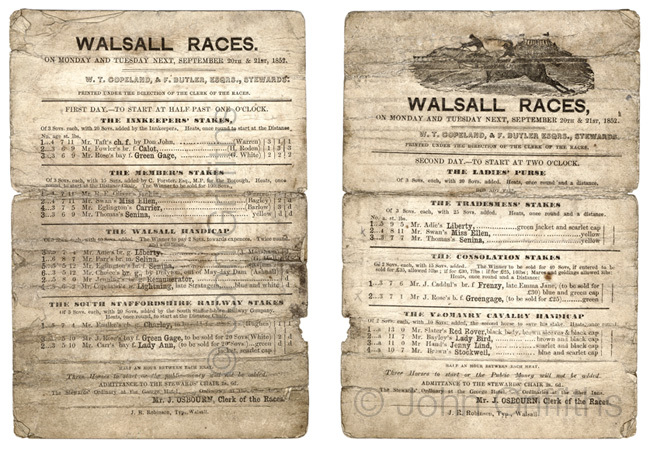 The first announcement of Walsall Races in 1755 which they were being run at least 22 years earlier than first thought. The Jockey club was formed in 1752 as a club for owners and breeders to advance the breeding of thoroughbred horses. To be a member in those days it was said you had to be a relative of God, and a close one at that. With the formation of the Jockey Club there were signs of some sort of organisation of racing filtering through but an independent administrator was required. In 1770 the Club appointed James Weatherby to the combined office of Secretary to the Jockey Club and Keeper of the Match Book. In 1773, with the help of Weatherby, the Jockey Club produced the first edition of the Racing Calendar followed by the General Stud Book. The Racing Calendar is the annual record of racing in Britain. Walsall was first listed in this bible of the turf in 1785 when the official results for that year were published. Walking from Bradford Place, around The Cenotaph and up Bradford Street today, it is difficult, if not impossible, to realise the path taken skirts the perimeter of the old Walsall Racecourse. The race meeting coincided with the Walsall Fair, and for two days every year from around the mid-eighteenth century until 1876, horse races were run on land known as the Long Meadow. The land was owned by Lord Bradford who was obliged to allow the freeholders of the Parish to feed and graze cattle from Lammas Day to Candlemas each year; this must have made the going at times a little testing. Whatever the activities in that part of town on Friday and Saturday nights today, they become somewhat insignificant compared to the sheer mayhem created by our ancestors on race days – and nights! With spirits already high from the Walsall Fair the previous day, the races succeeded in prolonging the suffering for the many citizens of the town, and in later years, particularly those residing in Bradford Street. Both Fair and races brought with them their own selection of traditional shows, merry-go-rounds, swings and vendors of every description to entertain the public, and extract their cash. There was music and dancing, eating and drinking, buying and selling, swearing, shouting, weariness and disappointment, cocking contests, dogfights and pugilism, organised bouts or those spontaneous events that come about by the consumption of too much alcohol. The wheels of work stood still in Walsall of old in the last week of September. 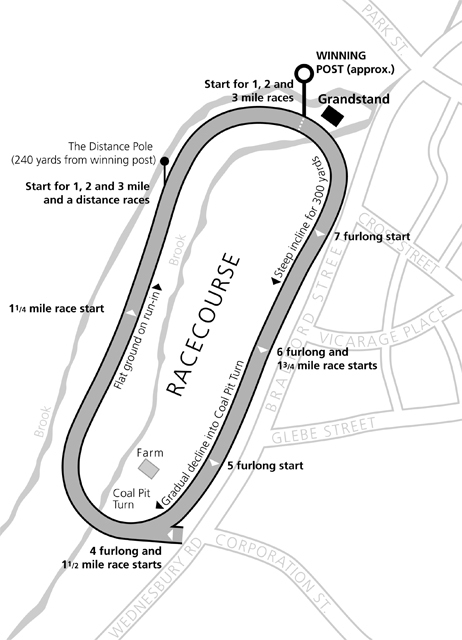 Little is known of the course itself other than it was oval, about a mile in circumference and the horses ran in a clockwise direction, when measured by the racing authorities it was found to be 20 yards short of a mile! The location of the winning post and judge’s chair has never been accurately determined, neither before nor after the grandstand was built-in 1809. It is fair to assume that after that date it was in close proximity to the grandstand. The runners would set off up the hill, which we now know as Bradford Street, they would continue towards Corporation Street (previously known as Coal Pit Lane) and then turn right at Coal-Pit Turn. After negotiating the turn, the runners would descend a slight incline and head back towards town along a flat piece of ground, which is now occupied by the railway. In Staffordshire at this time there were only two other courses organising meetings on a regular basis and they were the at Lichfield and Stafford. Years later, many other towns and villages in the county joined the growing list of organised race meetings but many of these tended to run for a few years and then disappear, only to reappear phoenix like after several years absence. Newcastle-Under-Lyme was the fourth town to join the list in 1786, others included, Bloxwich, Brewood, Burntwood, Burton-Upon-Trent, Cannock, Hednesford, Leek, Meynell, North Staffs (Stoke), Penkridge, Rugeley, Shenstone, Stone, Tamworth, The Potteries (N.E. Staffs), Uttoxeter and Wolverhampton. The bronze Subscription Token for the grandstand in 1809. The reverse side is badly pitted and the date, in roman numerals can just read. In 1809 a grandstand was built at a cost of £1300, money for the building was raised by subscription in shares of £25 each. Each subscriber received a “ticket” for free admission to the grandstand as well as receiving interest on their investment. The ticket was in fact a bronze coin or medal, an extremely rare item, one is shown in the photograph. The Races at this time were very fashionable and attended by many of the local gentry as well as those from further afield. With the industrial revolution well under way by now the growth of manufacturing industries in the town meant more and more people were moving to Walsall. This was good news for the organisers of the Races and the Fair, not such good news for those people who lived in close proximity to the course, particularly those in Bradford Street. The newspapers had a field day condemning the Races at every opportunity until final in 1876 the last horse race was run on the Long Meadow. I have always thought it suspicious that the last winner on the course was a horse named “Bloxwich” who won at 4-1. He was trained by James Hopwood at Hednesford and ridden by his son James junior, maybe it was pure coincidence but after writing and researching the book I think not! 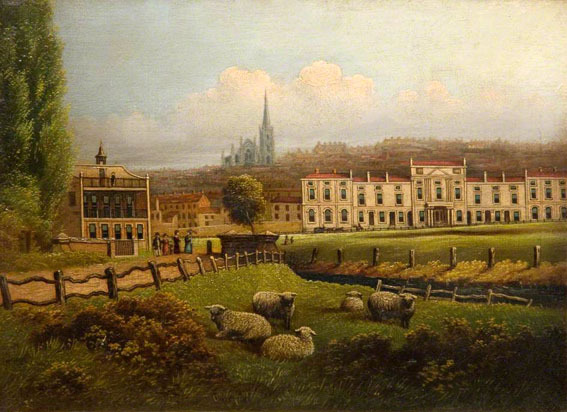 The Racecourse showing the grandstand and the houses on Bradford Street by an unknown artist. A racecard for the 1852 meeting. It must have been an exciting time for the working people of the town when the Fair and Races week came round even if the religious and temperance groups in Walsall saw it differently. With little to look forward to for the rest of the year in the way of recreation the townspeople embraced the events with open arms and in the words of Wallace to Gromit it was “a grand day out”. 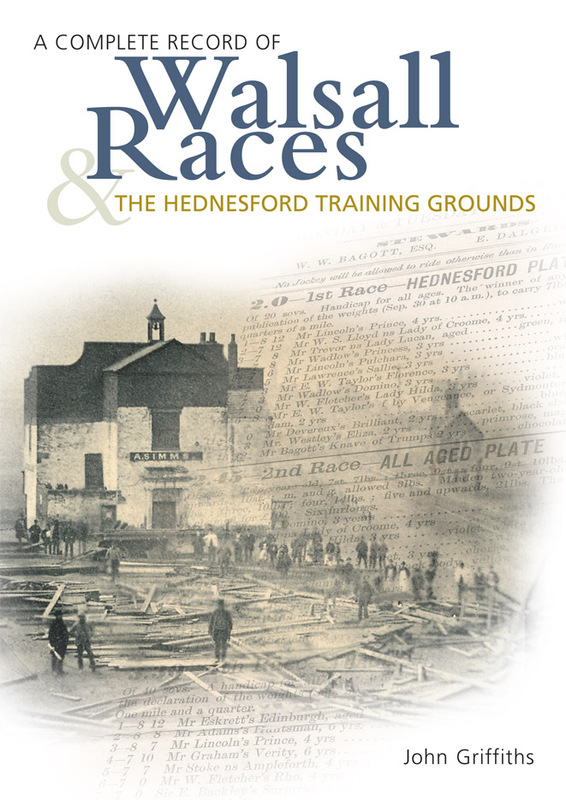 You are currently reading Walsall Races – c.1754-1876 at Walsall Life.